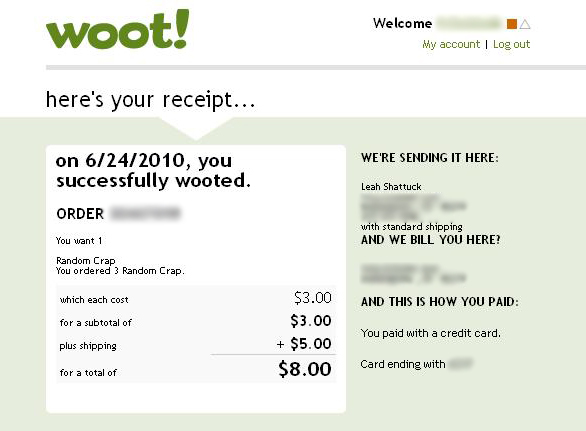 If you are unfamiliar with woot.com, I must explain briefly what it is. Every day, woot has a selected item that is usually overstocked from a manufacturer. Woot offers the item at a significant discount, and sells them all day until sold out. 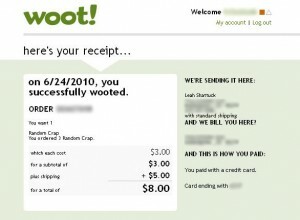 Occasionally, woot will have what is called a “woot-off” and have multiple items shown throughout the day. One item is offered for sale until it is sold out, then the next item is available. I think woot.com is a legitimate cause of attention deficit disorder and nerd insanity. People go crazy during wootoffs, and I can’t say that I haven’t joined in the mass hysteria myself. On rare occasions – though loyal woot-ers hope and pray and wait – there is a special item called Random Crap (pardon, for those that find that word offensive), which is basically a grab bag of nonsense. However, there are cases of people getting 42″ plasma TVs within this grab bag. So, naturally, all wooters find this BOC (woot acronym for Bag of Crap, which is now a Twitter hashtag) highly coveted and most are eager to achieve the prize. Woot typically only has a select number of these BOCs, and it’s a pretty big deal if you snag one. The waiting kept me on the edge of my seat. I am proud to tell you that last Thursday, I got the BOC crown of glory! I’m anxiously awaiting its arrival within the next couple weeks. Don’t worry – I fully intend to photo document the contents and share with the world my $8 prize! Holy cow – what if I get a TV?! Ugh. Why am I thinking that keeping a blog is tedious? I hardly ever update, and I don’t want to be one of those people. It’s after 10pm on the Saturday before Father’s Day, and I have to be up and early to lead worship at church in the morning, so that’s my excuse to keep this short. GARDEN UPDATE – Waaaaaay overgrown. I don’t know what we were thinking, planting so many veggies in such a little space! The radishes are huge and the cucumbers have taken over the world. I can’t really tell what’s a weed within this hodge podge, so I guess I’ll just wait to see if I see any orange (carrots) spring up or real green beans sprout. HOUSE UPDATE – Super sad panda face. Literally, the week after I posted exciting hopes about that cool Irvington house an offer had come through – not from us. So began my very obsessive and obstructive search for the perfect Irvington foreclosure house. It’s not happening very well, and I think Steven is getting really perturbed by all the web searching every evening. I will say that I’ve found some great bargins on houses. And if you have any questions about what’s out there right now, you should ask me. Perhaps I should have been a realtor! LUCY UPDATE – She is a better dog than Jake. Good grief. Right now they’re both sleeping on the couch next to me. She’s a huge clutz with a big heart. Steven’s calling her LucyBird. Fitting, somehow. NEPHEW UPDATE – Jeremiah is a rock star. He is out of casts, off oxygen and only needs one shunt! He still wears a heart monitor for the apnea and has special shoes to continue correcting his clubbed feet, but he’s doing so good. I’m very blessed to have a might network of prayer partners, and of course, a very mighty and loving God. NIECE UPDATE – My sister-in-law, Kelly, is about 20 or so weeks pregnant with my newest niece. Kelly has also had a strange and difficult pregnancy, and is currently on dialysis 5 days a week until she is born. After birth, Kelly will have to have a kidney transplant. Thankfully, little niece is healthy and strong and Kelly is feeling really good. She said this is the best she’s felt in 4 years (being on dialysis)…! MISC – I found a Game Boy pocket at a yard sale for $3 today. I’m pretty thrilled with this find because I used to scour eBay for a good deal and thought I was just silly for wanting one. I still have my old GB games, and I’m actually really excited to start playing them again. Since Steven got a PSP, I’ll just sit right along side him with my cool toy. As always, I’m amazed at how great our God is and what he can do. I’m looking forward to celebrating the family he gave me tomorrow during Father’s Day. This post only took me 20 minutes. I should do it more often!